Dr. Chow worked for several years at the Integrative Care Centre of Toronto with Dr. Alison Bested, a leader in the integrative treatment of patients with chronic fatigue syndrome, fibromyagia, and multiple chemical sensitivity (CFS/FM/MCS). Chapter 8 of this book on Pharmaceutical Treatments was co-authored by Dr. Chow along with Dr. Bested. This book is invaluable for patients with CFS/FM/MCS as it explains the symptoms of these conditions, how they are diagnosed, common causes, and how these conditions can be better managed with the assistance of medications, nutrition, stress management, and supplements. Contributing author in the book The Clear Skin Diet (Cumberland House Publishing, 2007). Dr. Chow formulated all 50 of the acne-fighting recipes featured in this book and provides information about many of these ingredients that may not be familiar to some individuals. For a sneak peak at these delicious recipes, click here for a small sample. 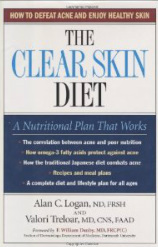 This book is an excellent resource that explains the causal connection between certain foods and acne. It also discusses foods and culinary herbs that help to lessen acne breakouts. The strong mind-body connection is also discussed and how it plays a role in influencing acne-promoting hormones. Published in the journal, Biology of the Neonate, ‘Dietary Echinacea purpurea during Murine Pregnancy: Effect on Maternal Hemopoiesis and Fetal Growth.